Find out what you need to know to manage IT risk in 2020 and beyond by attending this educational webinar. Register now! Payment Card Industry Data Security Standard (PCI DSS) pushes organizations to achieve six distinct goals in the aim of protecting payment systems from breaches and theft of cardholder data. 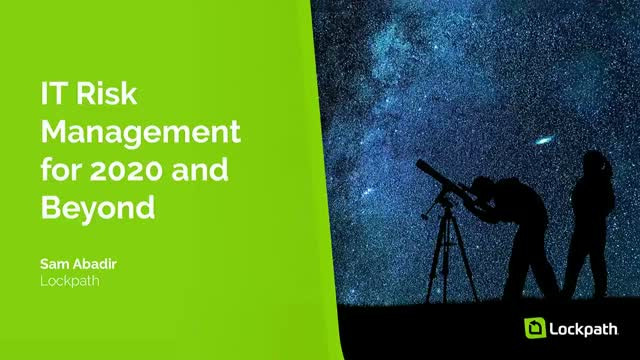 The requirements supporting the goals force organizations to manage, govern and integrate different departments within the business including IT, security, compliance, risk, incident response, and policy management. Those managing this effort quickly realize that the effort to achieve the goals effectively and in a timely manner requires PCI DSS to be a day-to-day part of your business executed with purposeful coordination and immediate access to information to continuously assess the PCI DSS environment, remediate vulnerabilities and report required information. Find out what you need to know to better manage your PCI DSS solution by attending this educational webinar. Register now! More than 80 percent of hacking-related breaches leverage stolen, default, or weak passwords, and compromising user credentials remains the easiest way for hackers to gain access to your systems and networks. The potential harm is even greater if those credentials belong to a privileged user. So, what are leading organizations doing to manage this identity-related risk? The answer is Identity Risk Management – the process of integrating an IAM system with an Integrated Risk Management or GRC program. Identity Risk Management, when executed properly, allows for improved risk visibility, better risk-based decision making, and reduces enterprise risk management siloes. In this 60-minute webinar, look into the future as leading identity and risk management experts explore how companies are utilizing this game-changing approach to manage critical identity risks. Our expert panel will outline the best practices for identity risk management, give you a behind-the-scenes look at how it works in the real world, and discuss strategies for overcoming some of the most common hurdles. Interaction between the financial industry and third-parties has become more complicated due to the combined risk of the financial industry's rapid growth and an increase in third-party relationships. Discover the future for compliance and policy management by attending this educational webinar. Register now! Learn how Keylight's approach to integrated risk management can help your organization and improve your business decision-making. Managing vendors, third parties and business associates is one of the most challenging aspects of business. In this exclusive webinar, our panel of industry experts will share their perspectives of the current third-party risk management landscape and where it's headed. As an attendee you’ll learn the latest trends in third-party risk and top predictions in 2020. Discover the future of third-party risk management in this can't miss webinar. Discover the future for configuration compliance management by attending this educational webinar. Register now! ISO compliance can be tedious, labor-intensive and an on-going task of managing processes. Learn how the Keylight Platform is the solution you need for ISO compliance. Discover the future for risk management by attending this educational webinar. Register now! Brief ad highlighting the benefits of the guide. What a year 2018 has been, from indictments and data breaches to an increasing regulatory landscape and a greater focus on integrated risk management. What were the major risk trends in 2018 and what predictions can we make for 2019? In this can’t miss webinar, our panel of industry experts will recap 2018 and offer their views on what to expect in 2019 and beyond. Plan now to attend this special webinar on 2018 highlights and trends and predictions for 2019. We talk a lot about risk management as part of an overall GRC security strategy, but today we'll focus on one specific area: configuration risk. Of all the types of security risks companies face, configuration risk is one of the most prevalent; it touches all company assets and affects all parts of the business, however, managing these risks is often deprioritized or overlooked. There are three main challenges organizations face when evaluating and managing misconfigurations: how to obtain a holistic and accurate view of company assets, how much risk does each misconfiguration pose to the company, and how to communicate these risks to other parts of the business for remediation escalation. Today’s 20/20 webcast explores these challenges in-depth and discusses how organizations can leverage existing GRC security strategies to address and reduce configuration risk. There’s no question about it, risk and compliance management are complex. Requirements are always changing, there’s always something to review, and some item is inevitably overlooked creating new risks you don’t know about. When it’s time for an audit, it’s anyone’s guess where the information you need is stored, and if it’s the latest version. It requires a lot of time, resources, and effort to make sure responses are accurate. Put risk under new management. Lockpath, a leader in integrated risk management solutions, helps companies understand and manage risk. Subscribe to the Lockpath channel for educational webinars exploring a wide range of topics such as risk management strategies, information security best practices, industry and regulation insights, and more.